Seems so long ago, Leonard! Det er Leonard Cohens verden. Vi andre bare synger »Halleluja« i den! Leonard Cohen etterfulgte Jimi Hendrix på Isle of Wight-festivalen i 1970 og lyktes med å fange de over seks hundre tusen tilstedeværende (?). 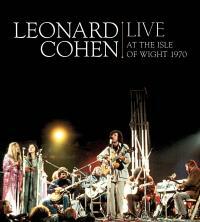 On August 31, 1970, 35-year-old Leonard Cohen was awakened at 2 a.m. from a nap in his trailer and brought onstage to perform with his band at the third annual Isle Of Wight music festival. The audience of 600,000 was in a fiery and frenzied mood, after turning the festival into a political arena, trampling the fences, setting fire to structures and equipment – and stoked by the most incendiary performance of Jimi Hendrix’s career, less than three weeks before his death. As Cohen followed Hendrix’s set, onlookers (and fellow festival headliners) Joan Baez, Kris Kristofferson, Judy Collins and others stood sidestage in awe as the Canadian folksinger-songwriter-poet-novelist quietly tamed the crowd. Academy Award-winning documentary filmmaker Murray Lerner, whose footage of the 1970 festival did not begin to see release until 1995, was able to capture Cohen’s performance. Likewise, Columbia Records staff A&R producer Teo Macero, who was ostensibly there to record Miles Davis’ set, did a brilliant job of supervising Cohen’s live recording as well. The releases represent the 77-minute concert set as performed by Cohen and his backup band: Bob Johnston (Cohen’s Nashville-based Columbia A&R staff producer), and Nashville musicians Charlie Daniels (electric bass, fiddle), Ron Cornelius (lead guitar), and Elkin ‘Bubba’ Fowler (bass, banjo). They were joined by backup singers Corlynn Hanney, Susan Musmanno, and Donna Washburn. During the course of their European tour – which Cohen only agreed to undertake if Johnston (producer of Cohen’s most recent LP, Songs From A Room) would manage him and organize the band – the group began to call themselves The Army, owing to the battles they were subjected to by audiences on the road. Bonus Interviews: Bob Johnston, Judy Collins, Joan Baez, Kris Kristofferson.